from 15 pcs. 0,63 EUR ea. from 40 pcs. 0,56 EUR ea. More than 3,7 million sold! This disc magnet is one of our bestsellers. With its adhesive force of approx. 3 kg, normal whiteboard and magnetic board applications do not present a real challenge. Also, it's rather difficult to remove it. This magnet is simply created for a higher purpose and it favours a heavier burden. 5 pcs. 0,89 EUR ea. 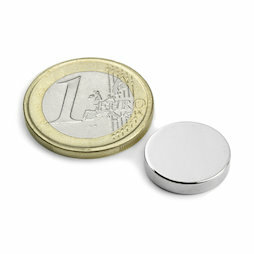 The strong disc magnet for experiments and handicraft work, even of the bigger kind. Stage decorations in the theatre and flowerpots at eye level are only two examples that customers came up with. The spacer washers between the disc magnets are helpful. Without them it is very hard to separate the strong magnets from one another. This means they are also strong enough to inflict pain: If two magnets are too close, there is a danger of jamming your skin in between the magnets. No one is too small for being worth a rescue!